Mr. Erik Scott has quite the resume. From playing with Alice Cooper and Flo & Eddie to releasing a string of successful new age world instrumental releases, his influences are dramatically different. And The Earth Bleeds was released in the spring of this year so I did not expect another album so soon. 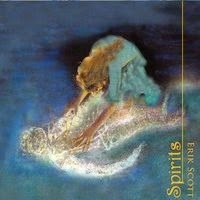 Spirits is Scott’s second release this year so to say the man is in a groove would be an understatement. Groove being the operative word here considering he is a bass player. Violins, flutes, electric guitars, various keyboards and more make up this montage of audible delights. I think diversity is the key to success in area of employment and never is it more evident than with Scott’s music. His bass is a magnificent tool that prompts all the other sounds to bubble to the surface in the most wonderful way. “Free (Instrumental)” is a Celtic influenced track that is modern and clean yet it takes something from years long past and carries on the tradition and legacy of that timeless sound. If you are not thinking of castles and horse drawn carriages while listening to this song you had better check for a pulse! Scott’s bass is quite prolific throughout this recording; his prominence and importance to the overall presentation reminded me of the dominance of a Jaco Pastorius or Tony Levin. It is like the purity of a hot springs bubbling essence and the synchronicity of time meeting for a grand explosion of colors and sounds. It’s both beauty and wonder put together in one tightly wrapped package. “Donnie and Sancho” takes you to yet another time and place, Scott’s bass rolls over your body like a warm summer breeze and you feel like you are on a private beach in Mexico dipping your toes into the ocean. Ambiance and the intermingling of genres create a dance as the sands of time stand still. His bass is powerful, beautiful and ambient at times. It is kind of hard to explain but you have to hear it and feel it to totally assimilate the entire presentation. I know that sounds complicated but it’s actually quite the opposite because it’s right as rain straight on through. “Weightless” has a way of making you feel that way and once again the picture is painted on the right canvas. You find as things move along that this artist has impeccable taste and knows exactly how to create emotion and a deep sense of being one with the music. “Run (Instrumental)” has a tribal world feel to it as many different instruments take part in the festivities. It makes you feel like you are in the wide open spaces with an ancient civilization during some kind of ceremony or ritual. It gives you timeless music and a space to fill it all in with the inner most thoughts one can create as you take it all in. And if all of that wasn’t enough he does his own unique version of The Beatles “Yesterday,” which is brilliant. In a word, this man does more with one bass than some bands do with multiple instruments at hand. “Proper Son” is the penultimate track that takes the bass as a lead instrument to an entirely new level. The combination of Scott’s bobbing and weaving bass lines coupled with layers of various instrumentation, are so impressive. I can hear this track playing during a rather exciting scene in a movie, perhaps a pursuit of climbing the highest peak or a deep jungle adventure. The music keeps you focused and mesmerized, track after track it will immerse you and make your heart sing. An consuming musical experience is what everyone needs on occasion and if you give Spirits a chance it will make you whole and satisfied with who you are and your surroundings. That is the purpose of a great musical experience. The day and stresses melt away and there is nothing else to focus on but the music. To me this is heaven, the very Spirit of mankind in its essence and purity, unencumbered by distractions. Spirits is a masterstroke of divergence and a cultural musical stew of joy and absolute bliss. It would seem one could listen to this album and land just about anywhere in the world. This is indeed a job well done Mr. Scott! You are a very talented individual and I hope you continue on this path you are on and have some more joy to bring us again very soon.